On November 26, 1988, the top Soviet Super Heavyweight, Leonid Taranenko, cleaned and jerked 586 pounds -- a phenomenal feat of power in itself, but even more dramatic because it shouted that the 600-pound barrier was going to be cracked pretty soon. Lift 600 pounds from the floor to arms' length overhead? My, my. Up to the mid-1950s, 600 pounds was generally regarded as the world record in the squat, and it was a very dramatic moment in the mid-1960s when Pat Casey broke the 600-pound bench press barrier. Go in most gyms today and a 600-pound deadlift still wins you a little respect. We can't promise that you, too, will break the 600-pound barrier in the jerk, but if you follow this program conscientiously, you should learn to hoist more weight overhead than with any other method. Let's get to the bad news right away. Lifting weights overhead is difficult and feels unnatural to most people initially because overhead movements are rare in most sports. This means that you should be content to feel a little awkward at first -- and weaker than you might like -- but if you persist, the power and the stability are sure to come. to maximize progress up the learning curve, Jim Schmitz likes to break learning the jerk into three phases, with a primary exercise for each of the phases. On all the jerking movements be sure to keep the bar over your ears rather than putting it out front where you can see it. The PUSH-PRESS will teach you to drive the bar with your hips and thighs before locking out with the triceps. Begin the push-press as if you were going to do a standard military press, except rotate your elbows a little to the front (lifting them higher). 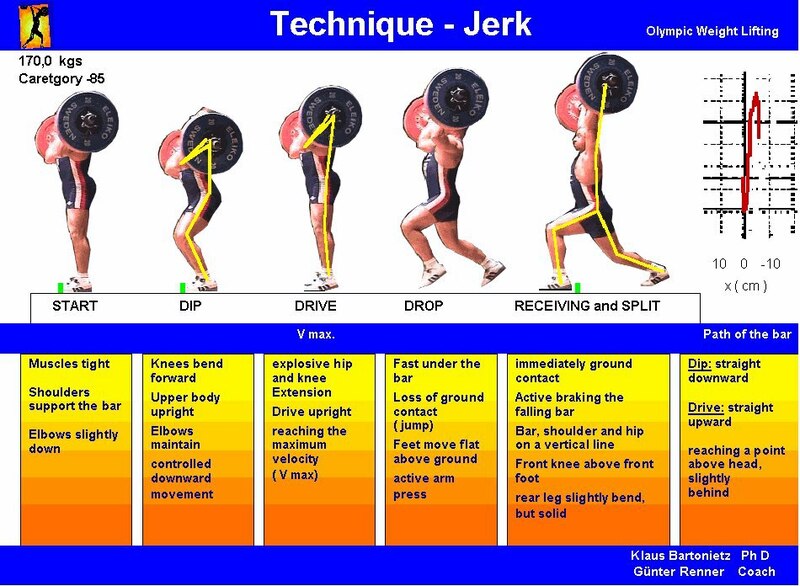 This should put you in the standard get set, or starting, position for all of the jerk movements. Using a grip slightly wider than your shoulders, let the bar rest on your deltoids and clavicles, just barely touching your throat, with your elbows up in front of your chest. Next, dip your legs three to five inches and drive up, pushing with your arms at the same time. Your leg drive should take the bar to about the top of your head, leaving you with only a bit more than a lockout to complete the push-press. Be sure you dip and drive in a straight, vertical line and make your dip deliberate. After that your drive should explode. Begin and end the push-press with your eyes focused straight ahead, but as the bar passes your chin, tip your head back slightly to avoid smashing the bar into your jaw. The push-press sounds more complicated than it is, so don't be intimidated by all these style points. After one month of working on the push-press, begin working on the PUSH-JERK. Take the bar from the rack, get set, dip and drive just as in the push-press, but instead of pressing the bar up to finish the lift, drop into a quarter squat as the bar passes the top of your head and catch the bar on straight arms over your ears. The push-jerk is designed to teach you how to drop under the bar and catch it overhead on fully extended arms, so don't make the mistake of pressing out the bar on this exercise. 4) bring your rear leg forward so both of your feet are in a line. Dropping a heavy weight after getting it overhead is the price you will pay for trying to recover too quickly or doing things in the wrong order, so follow this pattern carefully. Always include FRONT SQUATS in your training program, as they will give you the basic leg strength to drive up your jerks, and they will help accustom you to holding heavy weights on your chest in the get set position. 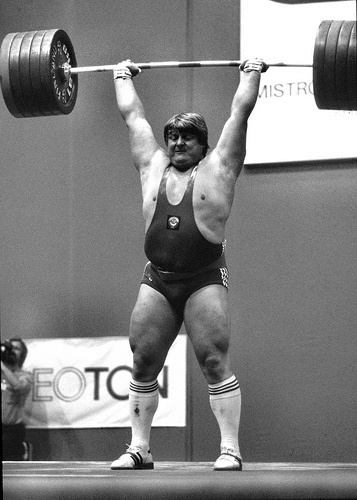 Many an Olympic and World Championship have been lost by missing the jerk after successfully cleaning the winning weight, so don't neglect your training on this second half of "the King of Lifts."